Physical medicine and rehabilitation (PM&R), also known as physiatry or rehabilitation medicine, aims to enhance and restore functional ability and quality of life to those with physical impairments or disabilities. Welcome to The HARBOR Group! Call us at (508) 999-4040 today. Located in the heart of New Bedford, the leading health professionals at The HARBOR Group are dedicated to helping you achieve your wellness objectives -- combining skill and expertise that spans the entire chiropractic wellness spectrum. Dr. Nicholas Psichopaidas is commited to bringing you better health and a better way of life by teaching and practicing the true principles of chiropractic wellness care. Patients seeking treatment at The HARBOR Group with Dr. Nicholas Psichopaidas are assured of receiving only the finest quality care through the use of modern chiropractic equipment and technology. Dr. Nicholas Psichopaidas and the staff have a genuine concern for your well-being! If you are new to our website, please feel free to discover and learn about chiropractic wellness. If you are interested in starting your journey towards wellness please subscribe to our award winning newsletter. If you are already a newsletter subscriber, please explore the member wellness section of our website for wellness articles, resources, and health facts---specifically targeted by Dr. Nicholas Psichopaidas to your wellness needs and interests. On February 5th, 1974 Dr. Nicholas Psichopaidas was born on his Father's birthday in Stamford, Ct. Within little time his parents relocated to southern Massachusetts to further their quest of serving people. Mr. and Mrs. Psichopaidas have an affinity of serving people with what they do best: cook. "My headaches have been bothering me for years. I've been told that I have migraines and yet every doctor has described a different headache to me. After seeing seeing Dr. Nick, I learned not only do I have neck troubles but that my headaches are more structural than anyone has told me. After thorough neurosurgical evaluation per Dr. Nick's referral I have been cleared and now include chiropractic care in my life. The chiari-I malformation has been the reason for many of my headaches yet chiropractic care provides much relief. Thanks Dr. Nick." 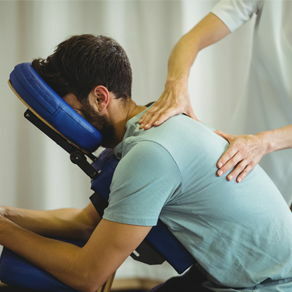 "I've been a fibromylagia patient for years and through various networks learned that chiropractic can affect my trigger points and tension in my muscles. I chose Harbor and after including them in my care not only do I feel better but my other symptoms have also improved. Dr. Nick and chiropractic will always be a part of my care." "After being in pain for weeks there was nothing more I wanted to here than, we can get you in today. Needless to say I felt great in little time. Great office, great staff and was happy that my visit including x-rays onsite. Thanks Dr. Nick great job."